Hundreds of umbrellas call for serious protection, not just a lock or bolt or curtain. Look at them there, all black and open, scattered across the roofless warehouse floor, so vulnerable. They needed me. What would they be without me? Just another heap of forgotten ideas fluttering about a dying fire, some meaningless amalgamations of chemical, allow and fabric. I could give them more than protection—definition, purpose, direction, and utility. Where the building once met the ceiling, hills of shattered brick and dust filtered the sunlight into distinct rays, thick beams that fell hard on the sea of umbrellas, as if the elements aimed to destroy them all one by one were it not for my stewardship. I’d counted the lucky find fifty times or more, spending the afternoon traipsing through the warehouse, back and forth, smiling and not believing it to be real: four hundred thirty-two black, retractable, nylon, fiberglass and aluminum, oak-handled umbrellas. All mine, all my flock of motionless, rain-resistant sheep. But how to keep them safe? Outside the splintered warehouse doors, the dry earth’s cracks and fractures spun toward the business center’s main drag, still clouded in gusts of wind and dust that raced casually around occasional, jutting remnants of industry. Here and there, forklifts sat naked where businesses used to open and close. Unrecognizable machines and appliances waited for someone to use them, desk chairs called out to be sat on, tangled phones impatiently strangled loose, unread files—but no one came here anymore. The storms and sadness and fear of radiators kept us out. Of course, other people passed through the business center, but not for long and not from our town. Our town sat safely over the hill, and everyone in the valley was, “LOOKING FORWARD, NOT BACK!” while suffering from a current of unspoken, “Please don’t remind me what’s happening,” that always threatened to make the transition to spoken but never realized it. My father told me visiting the business center is nostalgic, sentimental, and naïve. Years ago, he worked here, commuting every day by train. What once took him just a half hour now exhausted over an hour and a half of my morning and afternoon, a rocky bike ride in both directions. I hoped the isolation might protect the umbrellas from would-be entrepreneurs, if only until I thought of something more secure, but time was short. Apprehension seized me and I had to stop and look back just one more time before I left my umbrellas behind. God, they were glorious! I made fists and danced, then hopped on my bike and pedaled off over the foundations of forgotten stores and shops, shielding my eyes from the dirt, practically singing. Maybe I could revitalize the area with my booming weather preparation business! “Sure, we started small, but you can never get enough umbrellas—that’s my motto,” I’d tell the reporters. In any case, I could get a leg up on my loans. Maybe at this year’s Loan Day Celebration, the town council would crown me with the plastic scepter and ceremonial sash so that I could lord it over everyone while we snacked on peaches and fruit cups. Me: king of the Loans! For a day! Or an evening, rather, but still, I could just about taste all of the three to four hours of glory, syrupy sweet. I pedaled into town through the old turkey path, dodging cans and bones and old newspapers, skidded out onto Park Street and made my way to the bus stop, barely able to hold in my giddy mood. Collin waited for me on the bench. He almost made the place look like a bus could show up, if you covered one eye and pretended the sign that said no buses meant something else. In a way it did, but not anything I ever understood. I put on my best “I haven’t been ecstatic about four hundred thirty-two umbrellas” pose when I approached him. It included at least twenty percent glower, but also equal parts tousled hair and hand in the pocket. “What are you so happy about?” Collin asked without even looking at me. He had a fish in a bucket next to his feet that splashed and flapped like flapping and splashing might make a difference. 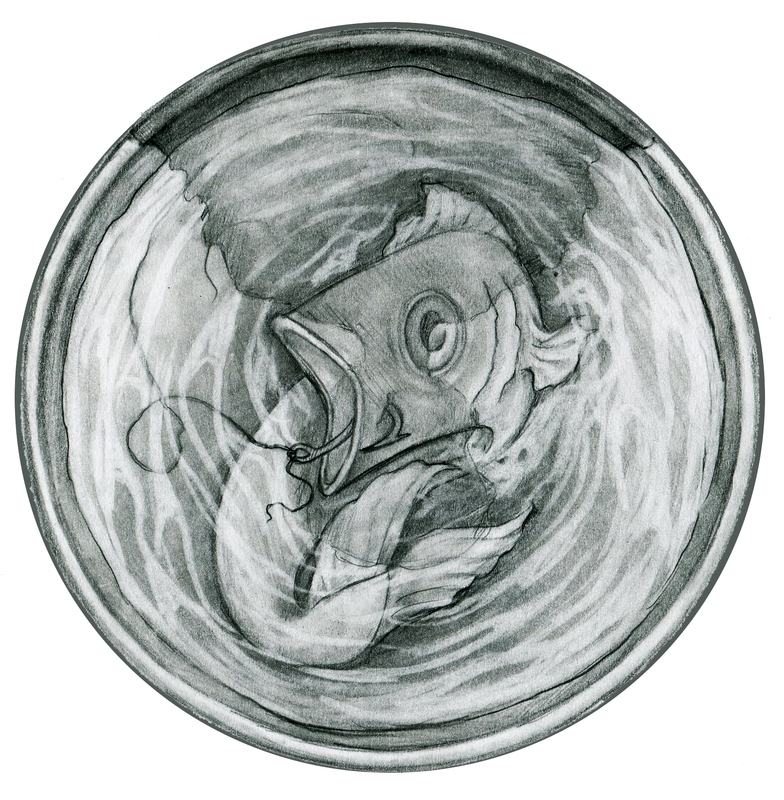 The hook fresh in its mouth leaked cloudy wisps of pale blood, pink in the grey water. He shrugged his shoulders and did that thing where he looks off into the distance because he wants to say something but can’t figure out how yet. I sat down next to him on the bench and we both gazed toward the mountains. I took out some sliced mango from my pack and started eating it. Collin had some too. He sighed and tapped his fingers. “So,” struggling to find the words, he squinted a bit and then said, “we have to go to the post office because your dad agreed to bare knuckle box Carl Stanley for everything he owns there in the back lot and everyone’s going to be there and man, I’m sorry I had to be the one to tell you, but there it is, so let’s go because we’re probably already late.” I chewed my mango, then another slice. Not quite ripe. The post office roof held hundreds of onlookers, but Collin and I managed to squeeze to the front. Down below, a circle of locals and postmen caged my dad and Clark, both bloody and shirtless. Mr. Stanley didn’t need to box my dad, but debt collectors usually agree if you ask. Ever since the issuing of our new interest rate contracts, which included The Boxing Clause—basically a cruel joke, I think, stating that “any persons in a fiscal relationship with Sally May Holdings, Inc can, if they choose to do so, file for a boxing match, pursuant of a claim to paid-in-full standing, to be witnessed and refereed by officials of the collector’s choosing, and following standard bare knuckle regulations and procedures”—upstanding men opted to lose everything on a bout of fists they couldn’t win. Each one of them believed that they, finally, would triumph as the single hero to beat the mountain, but debt collectors are well fed, well trained and have the refs on their side, so it’s all hopeless. But if anyone could do it, my dad could. To read the entire story, purchase issue one of apt in print or PDF.